All over the world you can find bridges. Bridges can take you from here to there, from there to here. Bridges can take you anywhere! When you discover a bridge, look at its form, span, material, and travel location. 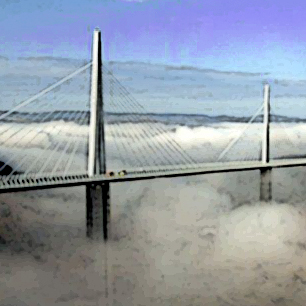 There are three basic bridge spans: simple, continuous and cantilevered. Simple span bridges cross from one support to another and can be joined together to create a longer span. Continuous span bridges cross from one side to the other with one structural beam truss, or arch. 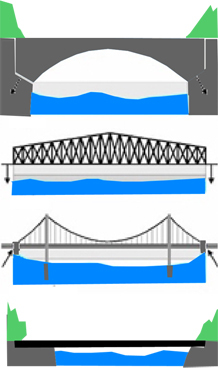 Cantilevered bridges are supported at one end or in the middle and are often held up by tensile suspension. Travel across bridges occurs on top of the structure or on the deck, in between structures that are not closed on the top (pony crossing), or through a structure that is connected on the top, sides, and bottom. Bridge forms can be beams (and girders), arches, trusses or suspensions. Locate a place on a map of your city. Why choose to build a bridge there? What is its purpose? What type of bridge can you imagine? How large will your bridge be? Will it carry people, vehicles, trains, bikes, and/or water? Will it open and close, or will it be fixed? Will its structure be heavy or light? Build a simple span bridge. Draw your design in plan and in section. Be sure to put the landscape in the drawings as well. A bridge is a simple span between two points. 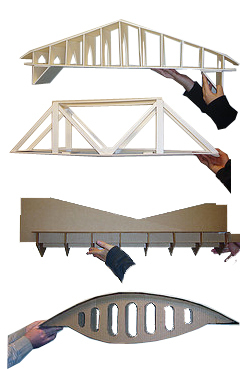 With your new knowledge about structural forces, design and build a bridge using the following instructions as your guide: Purchase only one sheet of 3/16" cardboard, 24’ x 36". Using only white Sabbo’s glue, an exacto knife, and your structural design skills, build a beam/truss element, to be tested until failure. The beam must have a clear span of 30" and can have a maximum of 2” bearing on each side. The maximum length of your bridge is to be 34”. Cut, fold, assemble, adhere, interlock, laminate, and shape the single sheet of card board using the least amount of material to provide the greatest amount of bearing capacity. Evaluate your bridge on: 1. weight of final structural member 2. capacity of bearing (centrally loaded in a bucket) 3. beauty of form (judged by your peers). Hint: the cardboard will fail before the paper, and the shape of the connection at the edge of the beam is critical. The beam will transfer the load immediately to the edges of the two drafting stools. The beam will compress at the top edge and will be placed in tension at the bottom. Plan your structure accordingly. First look at different trusses using the resources provided on the Truss Journey. Pick a truss design that interests you. Find a cardboard box (1/8" thick). Using only white glue, a matt knife, and your structural design skills, build a beam/truss element, to be tested until failure. The beam must have a clear span of 30" and can only have a maximum of 2” of bearing on each side. The maximum length of your bridge is to be 34”. Cut, fold, assemble, adhere, interlock, laminate, and shape the single sheet of cardboard using the least amount of material to provide the longest span. In this bridge design you will take two spans, support them midway, and build a suspension system that connects them together. Suspend them with string or wire. 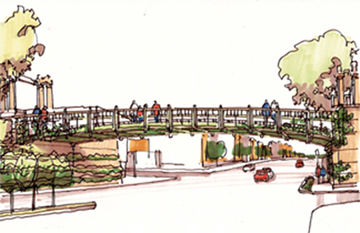 Besides function, bridge designers consider structural beauty. Some bridges are built taller than necessary to create a beautiful silhouette. This type, often found in east-Asian style gardens, is called a Moon Bridge, evoking a rising full moon. Other garden bridges may cross only a dry bed of stream-washed pebbles, intended only to convey an impression of a stream. Often in palaces a bridge will be built over an artificial waterway as symbolic of a passage to an important place or state of mind. A set of five bridges crosses a sinuous waterway in an important courtyard of the Forbidden City in Beijing, the People’s Republic of China. The central bridge was reserved exclusively for the use of the Emperor, Empress, and their attendants. Bridges today suggest connections between continents and cultures. Bridges not only serve a purpose, they can express meaning. 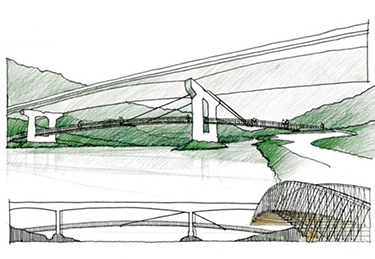 Design a bridge that expresses motion! CARRY ON! Be a bridge designer! Bridge designers only consider structure when designing a bridge. Bridges that move water are called aqueducts. The heavier the bridge the longer the distance it can span.